When you think “veggie garden” do you imagine row upon row of evenly aligned vegetables? Not anymore. Now, your colorful winter landscape can also serve a new purpose – you can eat it! Back in fall, we suggested planting salad greens among seasonal color and perennials. Soon, it will be time to add new crops of broccoli, cabbage, mustard greens, kale, cauliflower, and even more salad mixes among your plants raised beds, containers, backyard gardens and frontyard landscapes. Since you’re already a fan of organic gardening and landscape practices, adding edibles into your plantings is probably a natural fit for you. Purple or green cabbage is wonderful in containers along with pansies and violas. 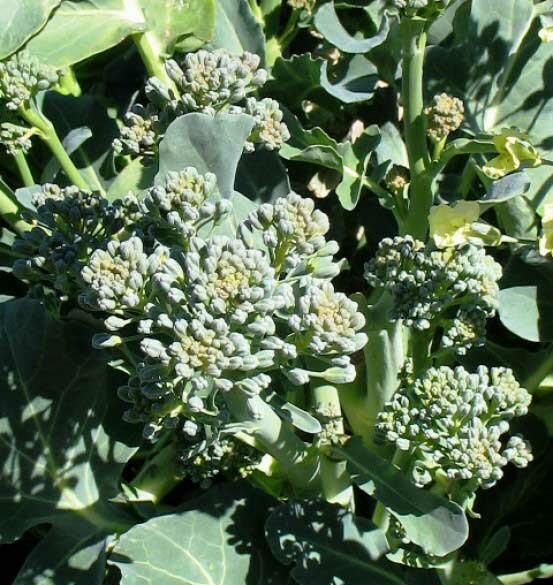 Plant broccoli or cauliflower as focal points among your Iceland poppies, then let some of the broccoli go to flower in spring to feed the bees. Swiss chard, mustard greens, and kale are perfect for either containers or directly in the garden. You could even add low growing lettuces as borders. Don’t forget herbs such as cilantro, dill and fennel are all cool season growers so you should plant and enjoy them this month. Be sure to also fill containers with edibles and keep them within easy reach of back doors and patios that lead to your kitchen. Planting is easy. Most local nurseries will begin to have a selection of new cool-season transplants in stock. Be sure to give all your edibles a good amount of sun. We recommend 6 hours of direct sunlight. Feed each month with an organic fertilizer, worm castings and water regularly. It’s always impressive to cook and garnish with ingredients right from your own organic, eco-friendly garden! Need some inspiration? We’ve got a Veggie Garden Idea Book on Houzz started for you.